Introduction Virtual microscopy is an exciting new modality that is being integrated into medical education. A nationwide collaborative effort between eight leading ophthalmology programs was undertaken to compile an extensive array of ophthalmic pathology slides to host online. To facilitate self-directed learning and assessment, Web site development included “hidden” interactive annotations, accessible only on demand, of relevant pathological findings. Methods A small subgroup of 24 ophthalmology residents currently matriculated in their second, third, or fourth postgraduate year across eight institutions independently evaluated the Web site. Educational effectiveness was assessed by anonymous survey. Features qualitatively considered included (1) level of postgraduate training, (2) prior ophthalmic pathology Web site experience, (3) perceived educational values, (4) difficulties encountered, (5) Web site utility, and (6) usefulness of a free-text comment box. 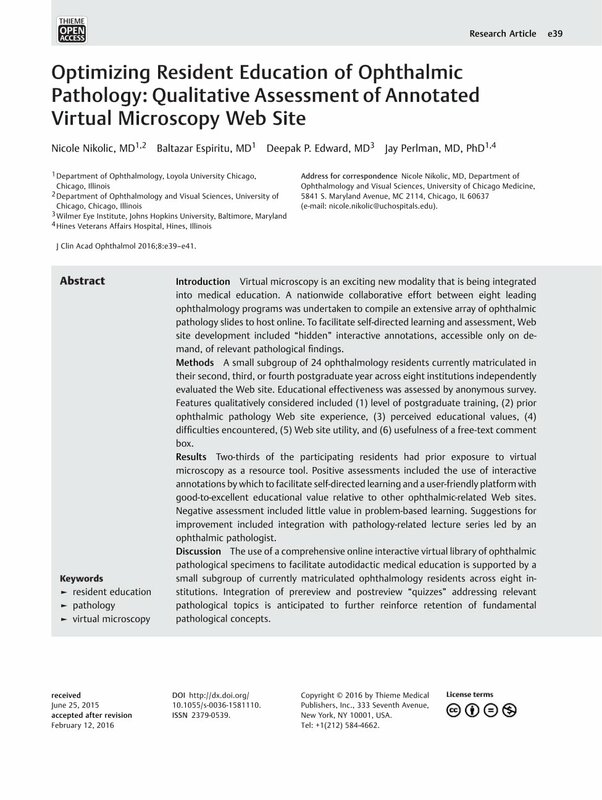 Results Two-thirds of the participating residents had prior exposure to virtual microscopy as a resource tool. Positive assessments included the use of interactive annotations by which to facilitate self-directed learning and a user-friendly platform with good-to-excellent educational value relative to other ophthalmic-related Web sites. Negative assessment included little value in problem-based learning. Suggestions for improvement included integration with pathology-related lecture series led by an ophthalmic pathologist. Discussion The use of a comprehensive online interactive virtual library of ophthalmic pathological specimens to facilitate autodidactic medical education is supported by a small subgroup of currently matriculated ophthalmology residents across eight institutions. Integration of prereview and postreview “quizzes” addressing relevant pathological topics is anticipated to further reinforce retention of fundamental pathological concepts.